After a day outside in the garden, at the beach, or in the cold, this cleanser feels comfortable and soothing on the skin. Bye–bye makeup build, dust and oil and hello smooth, clean, fresh soft skin in just 1 minute! What do I like about this cleanser! First of all it is safe for the eyes and is designed even for the driest and most sensitive skin, but can be used for all skin types (including acne-prone). This cleanser has a soft, milky texture and contains infusions of sage, chamomile, carrot and some other fancy herbs, natural oil extracts that will help condition the skin and give you a relaxing spa experience. What I don’t like about this cleanser! Even if it is called “purity” I have to say that among the natural oil extracts, in the ingredients list are also a few parabens, inorganic salt (disodium lauroamphodiacetate) and some surfactants that can occur mild irritations; but no worries they are non–toxic and you can find it everywhere from detergents to dermo-cosmetics. 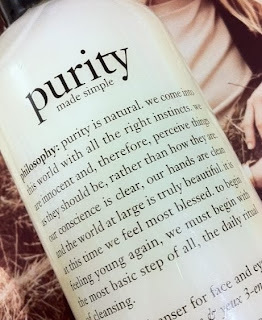 I came to the conclusion that Purity does not stand for "pure ingredients" … it stands for great CLEAN healthy skin as it deep cleans pores and eliminates make up build-up. Another thing that I hate about this product is the price but Philosophy is an investment... so worth it because your face is for all the world to see and for you to love. I think I will become a Philosophy girl, as for me this product improved my skin condition. I rate this product with 5 stars and I recommend it, I also have to mention that this product was not a gift from Philosophy and it was purchased from a store with my own money.